When I was invited to the press preview of “Leading Ladies and Femmes Fatales: The Art of Marc Davis,” at the Walt Disney Family Museum, I wasn’t expecting to be swept up by a remarkable, immersive celebration of the man’s life. Davis died January 12, 2000, but the art in this comprehensive exhibition still inspires, presenting his joyful personality through animation drawings, well chosen quotes, and an informative video interview. I met Marc once, briefly in the 1990s at the opening of an exhibit of Disney art at San Francisco’s Cartoon Art Museum. I remember him as a quiet, sweet, kind man, seemingly shy and soft spoken. He didn’t give an impression at all of being the versatile and vibrant subject of a soon-to-be-released book entitled Marc Davis: Walt Disney’s Renaissance Man. A quick look around the room confirms Walt’s accurate summation of Marc’s talent. The walls are adorned with iconic Disney female characters Marc designed and animated. They range from Cinderella, Tinker Bell and Alice (from Wonderland), to several evil ladies, including Maleficent from Sleeping Beauty and Cruella de Vil from 101 Dalmatians. According to an exhibit note, Marc conceived Cruella as a combination of Bette Davis, Rosalind Russell and Tallulah Bankhead. 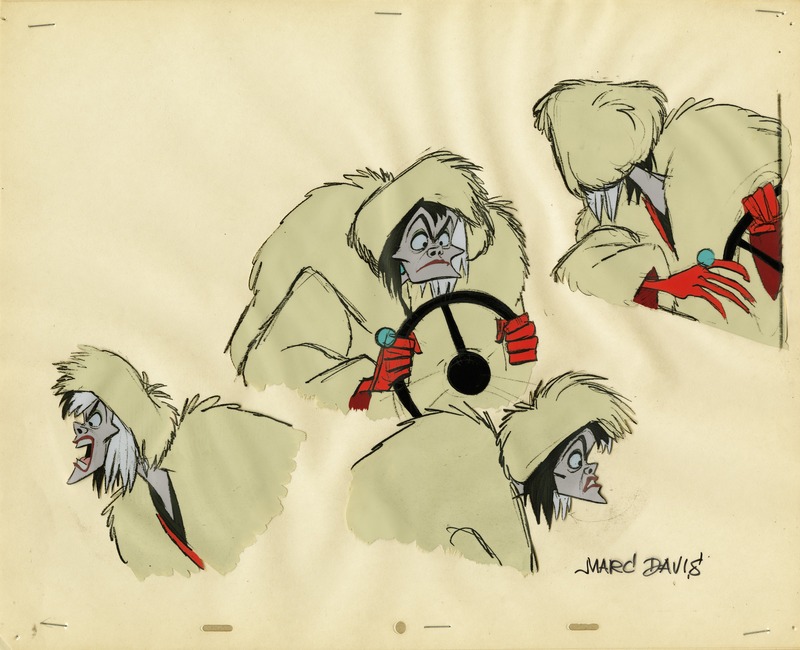 Character studies for Cruella de Vil by Marc Davis. “The Haunted Mansion” by Marc Davis. I introduced myself to director Andres Deja, who—with Michael Labrie, the museum’s director of collections—co-curated the show. Deja animated Scar in The Lion King, Jafar in Aladdin, King Triton in The Little Mermaid, Tigger in Winnie the Pooh, among other memorable characters. Deja, who joined the studio in 1980, described Marc as a wonderful mentor, both to him and others. He got to know Marc better in the mid-1980s when invited over to his house, which he remembered as a home full of incredible treasures. When Andres was asked to co-curate the show, he saw those treasures differently, more as a daunting challenge. How could he limit the number of works in the exhibit to only 70 things? There were thousands of drawings, paintings, photographs and other items he could include. For each drawing in the show there were dozens or hundreds of other drawings of the same subject that could have just as easily been displayed. Marc was a perfectionist who explored countless variables in his drawings. He sought the best solution to each design problem and was critical of things being drawn “off model.” Deja met his challenge and the works chosen for the show are wonderful examples of the man’s art. While much of my conversation with Deja was about Marc, we talked briefly about his own career and the state of the industry. Deja is concerned that the skills needed to create hand-drawn animation are being pushed aside by American studios. He believes stockholders are pressuring the Hollywood animation studios to be as profitable as possible and that part of the present solution to making money is to produce everything in 3D with computers. Feeling like he didn’t belong in that kind of environment, Deja left Disney to find enjoyment in working on an independent hand-drawn animated short. He is also writing a book about Disney’s Nine Old Men and is a contributor to the soon-to-be-published book Marc Davis: Walt Disney’s Renaissance Man, which includes contributions by Bob Kurtz, Glen Keane, Pete Docter, John Canemaker, Charles Solomon and several others. Deja’s advice for animation students is to first get a solid education in animation’s basic skills and principles, even if their professional careers will probably mean working with computers. Deja encourages focus on learning to draw traditional animation before learning complex technical computer programs. Karl Cohen will continue his story with an interview with Marc Davis’s widow, Alice. Click on “Join Our Mailing List” for updates when Part II is available and subscribe for future editions of EatDrinkFilms. 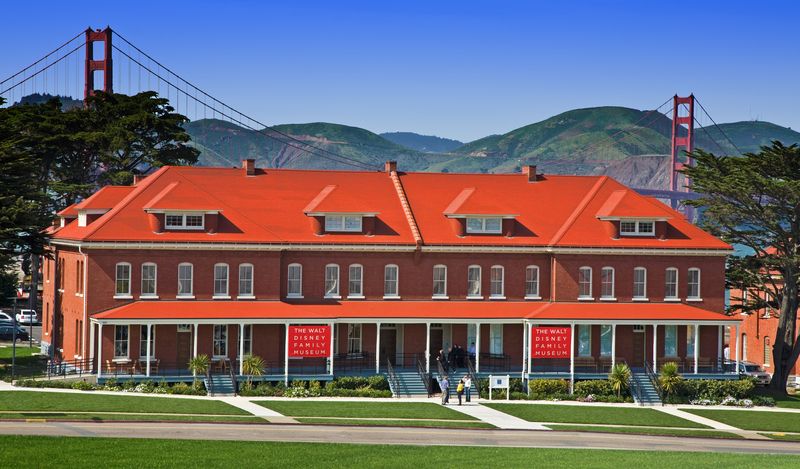 Visit the Walt Disney Museum’s page on Marc Davis’s exhibition here. This entry was posted in Films and tagged animation, Disney, Films, Mark Davis, museum exhibit, Walt Disney Family Museum. Bookmark the permalink.